French Hebraist and journalist; born at Metz Aug. 4, 1796; died at Paris Jan. 8, 1862. He was brought up at Mayence; pursuing a course of rabbinical studies and devoting, at the same time, much attention to modern languages and literatures. After completing his education Cahen was engaged as a private tutor in Germany. In 1822 he went to Paris, where heassumed the directorship of the Jewish Consistorial School, a position which he held for a number of years. In 1840 Cahen founded the Archives Israélites. 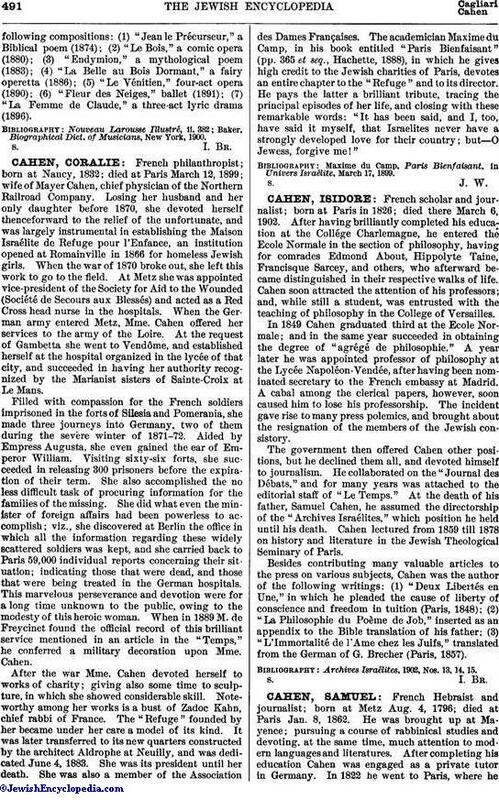 Cahen's main work was the translation of the Bible into French, with the Hebrew on opposite pages, and critical notes and dissertations by himself and others. The entire edition, consisting of eighteen volumes, appeared at Paris in 1851. Despite adverse criticism, denying Cahen critical perception in the choice of his material, it must be admitted that the undertaking exerted a great influence upon a whole generation of French Jewry. 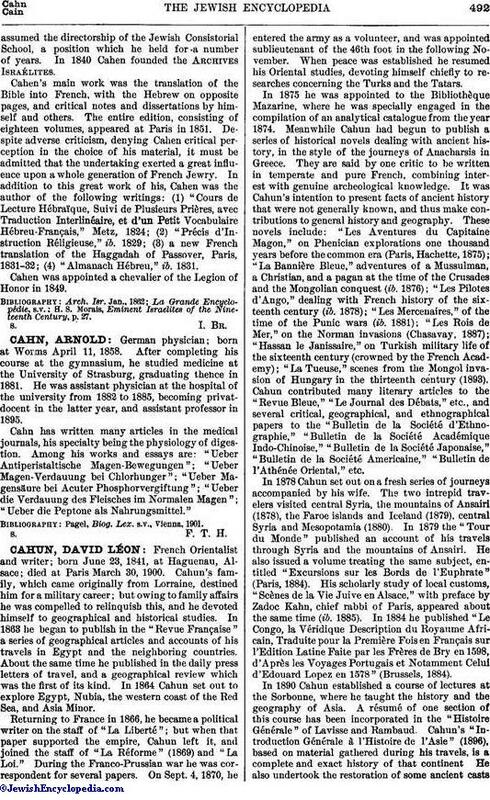 In addition to this great work of his, Cahen was the author of the following writings: (1) "Cours de Lecture Hébraïque, Suivi de Plusieurs Prières, avec Traduction Interlinéaire, et d'un Petit Vocabulaire Hébreu-Français," Metz, 1824; (2) "Précis d'Instruction Réligieuse," ib. 1829; (3) a new French translation of the Haggadah of Passover, Paris, 1831-32; (4) "Almanach Hébreu," ib. 1831. Cahen was appointed a chevalier of the Legion of Honor in 1849. H. S. Morais, Eminent Israelites of the Nineteenth Century, p. 27.